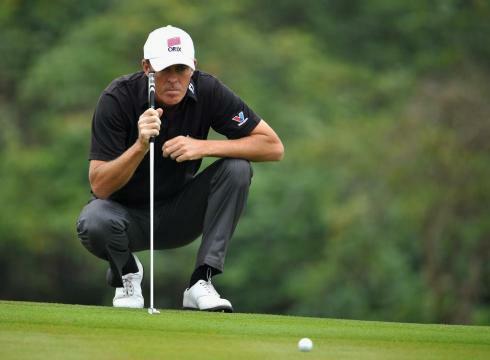 Richard Green of Australia lines up a putt during the the Omega Mission Hills World Cup at the Mission Hills’ Blackstone Course in Hainan Island, China. Australia took the lead in the first round of the World Cup on Thursday after shooting an 11-under 61, finishing two strokes ahead of tournament favorites Rory McIlroy and Graeme McDowell of the Ireland team. Richard Green and Brendon Jones totaled seven birdies and an eagle on the par-72 Blackstone course at Mission Hills golf resort on the South China island of Hainan. The pair finished in a share of third place in 2008 for Australia, which won the last of its four World Cup titles in 1989. "We just combined perfectly. We never doubled up on birdies, and that’s the key in this game," said Jones, who was still in high school when Australia last won. "You want to make a lot of birdies, but you don’t want to make them on the same hole. That’s what we did." Ireland made ground on the Australians on the back nine with McIlroy, ranked No. 2 and the U.S. Open champion, holing five birdies and an eagle. McDowell, the 2010 U.S. Open winner, had two birdies. McIlroy and McDowell represent their native North Ireland as individual players but Ireland in team events. They were runners-up in the last edition in 2009 to Italy’s Edoardo and Francesco Molinari, who currently have a share of 19th place. The format is two rounds each of foursomes and fourballs. Friday’s second round is foursomes with players hitting alternate shots. "The strategy changes tomorrow and is a very difficult day that it will separate the field a little bit," McDowell said. "Foursomes is probably the most difficult format of golf. You’ve got to play a little less aggressively. This is a difficult golf course. You’re trying to keep your partner in position. "Rory and I have played it in The Ryder Cups and the Seve Trophys, and it is probably the most pressure-packed format." Martin Liard and Stephen Gallacher of Scotland are tied for second with Ireland. The Netherlands’ Joost Luiten and Robert-Jan Derksen and Matt Kuchar and Gary Woodland of the United States are next on 64. "We don’t play that many team events in the States," Kuchar said. "The tournaments are mostly individual stroke play. I think the biggest difference here is having a partner, and it allows you to be a little more aggressive. I think my role is the steady role and I’ll let Gary be aggressive." Germany, Spain, Denmark and Colombia follow on 65, a stroke ahead of Ian Poulter and Justin Rose of England. Golf’s packed calendar means only a small number of top players are in China as the World Cup is no longer viewed by many as a marquee event. It was changed to become a biennial tournament following the inclusion of the sport into the 2016 Olympics in Brazil.